I Love You More Than Carrots: The Paper Mama Photo Challenge: Whatever! Here I am, entering The Paper Mama's photo challenge on this beautiful Saturday morning! 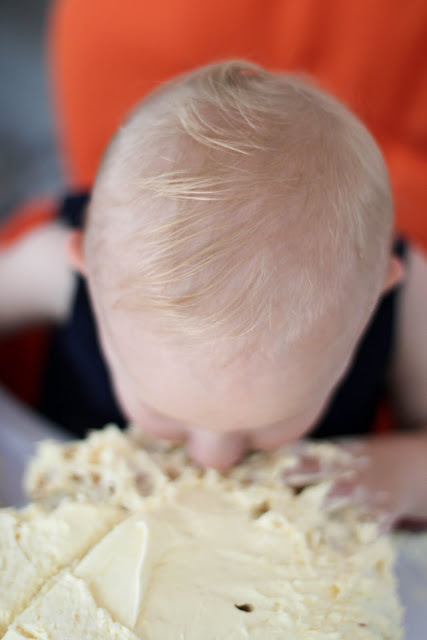 Even though you can't see his face, this is hands down one of my most favorite pictures from C's First Birthday Party. I can only imagine how excited he must've been to dig into that cake.. and to do so without using his hands! What a ham! Happy Saturday, Loyals! Have a great weekend! I absolutely love this picture! What a great moment to capture! what a memory to capture! great pic! I love reading your blog...it's one of my very favorites! I'm so happy you like mine, too. Thanks for being my first official follower :) ps. Go Maryland girls!! Oh my. I can see why this is a fave photo. The joy that is SUGAR!!!!!!! Nothing much can compare to that!